A battery is an electronic device made of one or more cells which converts the chemical energy packed within its active materials into electrical energy to provide a static electrical charge for power. Electrons are produced through electrochemical reactions which involves transfer of electrons via an electronic circuit. In simple terms, battery is a constant source of power which supplies electricity in the form of direct current (DC). A battery usually contains a positive (+ve) and a negative (-ve) terminal. The cell is the basic power unit of the battery which consists of three main bits. Plus there are two electrodes and a chemical called an electrolyte which fills the gap between the electrodes. When the electrodes are connected to a circuit, the electrons cross from the negative to the positive terminal, eventually creating an electrical charge. Energy is stored inside the battery in the form of chemical energy which gets converted into electrical energy, releasing electricity through a chemical reaction which eventually generates an electric current. Take an example of a flashlight. When you put alkaline batteries into the flashlight and turn the switch on, you do nothing but complete the circuit. The chemical energy stored within the battery gets converted into electrical energy, which then travels out of the battery, causing the flashlight to light up. This is because the electrons are crossing through the circuit. The cathode and anode are generally made of different materials. The positive electrode contains a material that gives up electrons quite easily such as lithium. The electrons get to the cathode only through a circuit which is external to the battery. The electrolyte – the most crucial part in the operation of a battery – transports ions between the chemical reactions that occur in the electrodes. These chemical reactions are collectively called as oxidation-reduction reactions. A capacitor (also known as a condenser) is also an electronic component that stores electrostatic energy in an electric field. They are more like a battery but they are used for entirely different purpose. While a battery uses chemical reactions to store electrical energy and releases power very slowly through an electronic circuit, capacitors are capable of releasing energy very rapidly. A capacitor contains at least two electrical conductors separated by an insulator (dielectric). When an electric field develops across the insulator, it stops the flow and an electric charge is starting to build up on the plates. You can find all types of capacitors ranging from small capacitor beads found in resonance circuits to high power correction capacitors used for large scale operations. 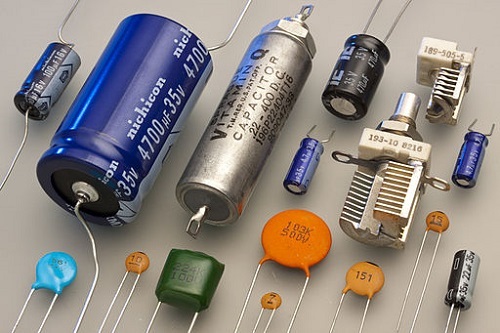 A capacitor basically consists of two or more metal plates which are not connected to each other but are electrically separated by a non-conducting substance such as ceramic, porcelain, cellulose, mica, Teflon, etc. The dielectric generally dictates what type of capacitor it is and for what it can be used ideally. While some capacitors are ideal for high frequency operations, while some are best suited for high voltage applications. Definition of Capacitor and Battery – While a battery stores its potential energy in the form of chemical reactions before converting it into electrical energy, capacitors store potential energy in an electric field. Unlike a battery, a capacitor voltage is variable and is proportional to the amount of electrical charge stored on the plates. Application of Capacitor and Battery – A battery can usually store a larger amount of electrical charge, while a capacitor, on the other hand, are capable of handling high voltage applications and ideal for high frequency uses. Charge/Discharge Rate of Capacitor and Battery – The rate at which a capacitor is able to charge and discharge is usually faster than what a battery is capable of because a capacitor stores the electrical energy directly onto the plates. The process gets delayed a bit in case of a battery due to the chemical reaction involved while converting chemical energy into electrical energy. Energy Storage of Capacitor and Battery – While both electronic devices are used to store electrical energy, the way they do vary dramatically. A battery stores electrical energy in the form of chemical energy, while a capacitor stores electrical energy in a magnetic field. This is why batteries store a lot of charge but they charge/discharge very slowly. Polarity of Capacitor and Battery – The polarity of the electronic circuit must be reverse while charging a battery, while it must be same as it is supposed to be while using in case of a capacitor. A battery maintains a constant voltage flow across the terminals and it is discharged only when the voltage goes down. 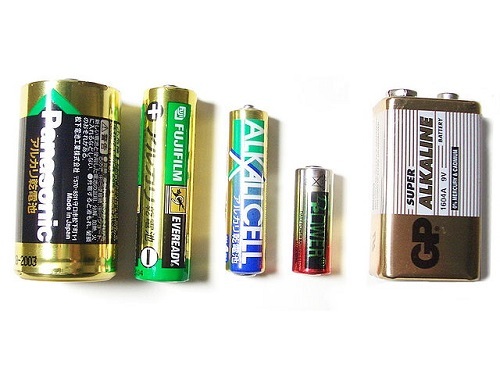 A battery stores its potential energy in the form of chemical energy. A capacitor uses electrostatic field to store electrical energy. It has a better energy density which means more energy per volume can be stored. It has a comparatively low energy density than a battery. It is basically a DC component. It is ideally used for AC applications. Charge/discharge rate is relatively slower than capacitors. Charge/discharge rate is usually faster than a battery because it stores energy directly onto the plates. Charges are not separated in a battery. Electrons are pre-stocked in capacitors. Battery runs for a longer time. Capacitors discharge almost instantaneously. Both batteries and capacitors are electronic devices capable of storing electrical charge and they seem awfully similar as they both release electrical energy. However, the way they do it vary dramatically. While a battery stores potential energy in the chemical form, a capacitor stores its potential energy in an electrostatic field. In simple terms, batteries store and distribute energy in a linear form – like a constant electrical flow. Capacitors, on the other hand, distribute energy in short bursts. A capacitor stores energy directly onto the plates which makes charging/discharging a bit faster than batteries. However, batteries are capable of regaining their stored energy much efficiently and for a longer duration than capacitors. Sagar Khillar. "Difference between Capacitor and Battery." DifferenceBetween.net. July 16, 2018 < http://www.differencebetween.net/technology/difference-between-capacitor-and-battery/ >.